This is a thinly disguised final, urgent, anguished plea for votes for the PA's Top 10 Endangered Artifacts campaign. You have until midnight, mwahhahhhahhh. UPDATE NOV. 1: I WAS SOOOOO WRONG. YOU CAN STILL VOTE UNTIL TONIGHT. GO. GO. GO. Coal sculptor C. Edgar Patience's bust of Abraham Lincoln from the Anthracite Heritage Museum and George Rapp's cap and coat from Old Economy Village are in 2nd and 3rd place. Let's see if we can move them up to the top. Boo!! Here’s a little something extra for the day. Blue Ridge Communications visited several sites in Lancaster County to talk about haunted history. You can find the extended version of the program on YouTube or if you live in the Blue Ridge service area on Channel 11. To save you some time, there are shorter clips below for Ephrata Cloister and the Railroad Museum of Pennsylvania. And a few still photos from sites on the Trails of History. Final stretch, people. We are down to the last week of voting in the PA’s Top 10 Endangered Artifacts campaign. Due to a surge from the pack, Abraham Lincoln is now in the number 2 spot, with George Rapp in 3rd place. Abe enjoyed a run at the top for a good week, and we can get him back there and push George to 2nd if we all pull together. Thanks to all who have participated in this online effort. We need you to keep at it. Vote, Support, Share. Repeat. The PHMC is accepting nominations for state historical markers, with a deadline of December 1. Detailed instructions and application form are on the PHMC website. The Friends of Washington Crossing Park have issued a call for applications from reenactors interested in participating in the annual Christmas crossing event. The registration packet provides details; deadline for receipt of applications is Oct. 28. Photos of October special events on the Trails of History: Anthracite Heritage Museum's Bonfire at the [Scranton Iron] Furnaces, Harvest Day and Craft Festival at Daniel Boone Homestead, Harvest Days at Landis Valley Village and Farm Museum, and the M60A3 Tank Tour at the Pennsylvania Military Museum (still photos and video). Less than two weeks to go in voting for your favorite among PA’s Top 10 Endangered Artifacts. Thanks to your help, a bust of Abraham Lincoln by coal sculptor C. Edgar Patience (Anthracite Heritage) and George Rapp’s cap and coat (Old Economy) are occupying the top of the list (Number 1 and Number 3 when I checked on Thursday afternoon). This is no time to let up! At least one other artifact is staging a happy hour click-a-thon to improve its standing. Such blatant politicking (that I totally wish I had thought of). Please vote as often as you can (financial support and social media shares are also greatly appreciated). It’s been a couple of weeks since we posted a progress photo of the visitor center expansion at the Pennsylvania Lumber Museum, so here are two progress photos of the visitor center expansion at the Pennsylvania Lumber Museum. 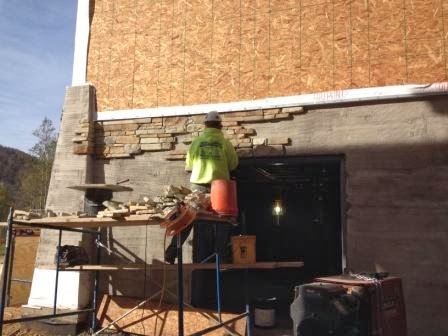 The top photo hows stonework being applied to the exterior of the building last week. On the bottom, the museum's logo is stamped on interior woodwork produced at the sawmill on site. Thanks to Jeff Bliemeister for the photos. Speaking of photos, the fall foliage contest at Eckley Miners’ Village is still accepting entries. Eckley’s website has information on how to participate. Lancaster County Museum Fest continues. Now through November 30, celebrate fall in Lancaster County with a wealth of museums, including three on the Trails of History—Ephrata Cloister, Landis Valley Village & Farm Museum, and the Railroad Museum of PA. If you’re suffering withdrawal from War of 1812 coverage, you can read Paulette Dinniny’s interview with US Brig Niagara senior captain Walter Rybka on the Pennsylvania Heritage magazine website (the interview originally appeared in the Fall 2013 issue). Or you can follow the progress of ship repairs on Facebook. Most sites on the Trails of History will be closed Monday, Oct. 14, for Columbus Day. 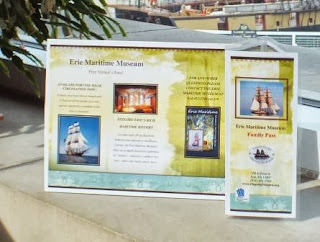 The exceptions are: Drake Well Museum, Fort Pitt Museum, and the Railroad Museum of Pennsylvania. We have a little less than 3 weeks left to back our favorites in the Pennsylvania’s Top 10 Endangered Artifacts campaign. Please vote, support, and share. So far there are lots of votes, but not nearly as many shares, and way fewer (what am I, 15?) supports. C’mon. It’s really easy. Not to influence the outcome or anything, but I’d like to steer you toward George Rapp’s cap and coat at Old Economy Village and Anthracite Heritage Museum’s bust of Abraham Lincoln by coal sculptor C. Edgar Patience. Both are currently in the top 5; help push them to the top! Pennbury Manor shared this on Facebook from American Historical Theater (AHT) earlier this week: “AHT is partnering with History Making Productions to cast background extras and principals (non speaking) for a new series of documentaries and webisodes about Philadelphia. The focus of the film revolves around William Penn, the Lenape Tribe, the first Swedish settlers and Pennsbury Manor.” You’ll find casting lists and contact info on AHT’s FB page; no dates for auditions, etc., when I last checked (yesterday). While we’re on the subject of Pennsbury, just a reminder that they are still gathering memories and stories in preparation for their 75th anniversary as a public museum in 2014. You can post yours on Pennsbury’s FB page. Before we take a look at events and programs on the Trails of History this month, a reminder that there is a little less than a month left to vote for Pennsylvania’s Top 10 Endangered Artifacts. As we noted in last week’s post, two artifacts in the PHMC’s collections are on the list—a coat and cap made for Harmony Society founder George Rapp (in the care of Old Economy Village) and a bust of Abraham Lincoln by noted coal sculptor C. Edgar Patience (at the Anthracite Heritage Museum). In addition to voting online, as often as possible, please consider a donation as well, to help with conservation and care of these objects (there are eight others on the list, of course, but you know where my bias lies). October is Pennsylvania Archives Month and Pennsylvania Archaeology Month. Both are focused on the 150th anniversary of the Civil War. 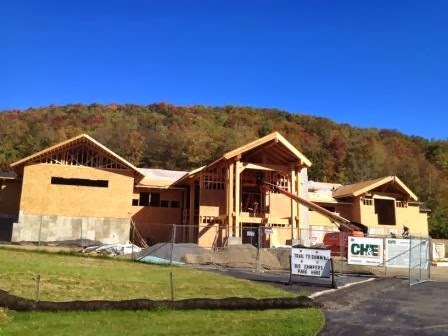 The building expansion at the Pennsylvania Lumber Museum continues, and the building is now under roof (or will be very soon). You can just see the beginning of northern tier fall color tinging the trees on the hillside behind the building. If you’re in the southeastern part of the state, Bowman’s Hill Tower at Washington Crossing Historic Park provides stellar foliage views (the best in Bucks County). Oct. 19: Bonfire and Harvest Festival—experience Celtic harvest traditions, food, music, and a roaring bonfire at the Scranton Iron Furnaces. This year’s program includes Scranton Shakespeare Festival's presentation of the three witches from Macbeth. Watch the Bonfire Facebook page for ticket deals and updates. 6 pm. Oct. 19: Halloween Event—Details to come. Oct. 12: Annual Fall Tea—call 724/527-5584 to be placed on the waiting list for this sold-out event. Oct. 26: Haunted History Hayride—tickets are on sale now. Call 724/527-5584 to place your order (leave a message with name, phone number, and number of tickets requested). 7-10 pm. Oct. 6: Site open—it’s the first Sunday of the month, so the site will be welcoming visitors from noon to 4 pm. Oct. 20: Weiser Interpretive Sunday and Fall Park Walk—enjoy the beautiful Olmsted-designed park, as well as hourly historic tours of the site. Free admission. Noon-4 pm (park walk starts at 2 pm, last historic tour is at 3). Oct. 8: Friends Lecture Series—Speaker Elaine Ainsworth will explore the genealogy of “The Coleman Family.” Lecture is free and takes place in Freeman Auditorium at Cornwall Manor retirement community. 7 pm. Oct. 20: Heritage Day and Market Fair—activities planned for this annual event include a market and craft fair, Pennsylvania German food vendors, and a demonstration of 18th-century beer brewing. Admission: $8 (age 16+), $6 (age 65+), $5 (age 5-15) (Friends of Daniel Boone Homestead get in free). 10 am-4 pm. Oct. 26: Haunted Homestead Tour—this new evening program will include Halloween-themed guided walking tours of the historic area; program is intended for ages 8 and up. Admission is $6 (combo tickets include admission to the Oct. 27 program as well). 6-9 pm (please note that site will close at 3 pm that day and reopen at 5:30 for the program). Oct. 27: Halloween at the Homestead—there will be loads of activities for kids, including trick-or-treating (costumes encouraged). Admission: $6 (age 16+), $4 (age 5-15) (Friends of DBH get in free). Noon-4 pm. Oct. 26: Oil Valley Blacksmiths—this is the last of the monthly blacksmithing meetings and demos for the season. 9 am-2 pm. 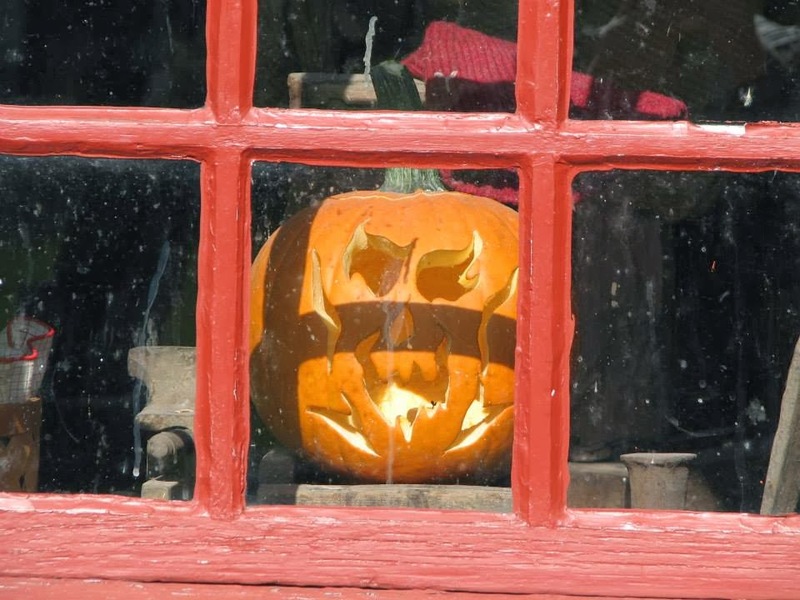 Oct. 11-12, 18-19, 25-26: Halloween Lantern Tours—tour groups walk through the 19th-century village and encounter funny, scary, and entertaining scenes (photos from previous years). Bring your own flashlight. Rain dates are Oct. 13, 20, 27, but you should check with the site to confirm. Admission: $10 (age 13+), $5 (age 6-12); this event is family-oriented but not recommended for children younger than 6. First tour leaves the visitor center at 6:30 pm, the last at 9 pm sharp. Oct. 11-12: Apple Dumpling Days—celebrate autumn, support the Back to the Cloister Fund (which helps to return original furnishings and objects to the site), and enjoy a wonderful Pennsylvania Dutch tradition. Saturday, Oct. 12, is also a Day of Music, featuring the Ephrata Cloister Chorus performing at 2, 3, and 4 pm. Site tours and Day of Music performances included in regular admission; no admission fee to purchase apple dumplings. 9:30 am-4 pm. Oct. 18: Community Days—this popular program is an educational open house, with learning stations scattered around the site. Students and their accompanying adults move at their own pace as they explore the activities. Admission: $6 for age 3-17; one adult admitted free with every 10 students; additional adults, $9 each. Reservations are strongly encouraged; call 717/733-6600. 9:30 am-1 pm. Oct. 18-19, 25-26: Mysterious, Melancholy, and Macabre—this evening program will share stories of strange occurrences witnessed by staff, volunteers, and visitors, as well as a dramatic presentation in the 1741 Meetinghouse. Advanced tickets (age 18+, $12; age 6-17, $10) are recommended, call 717/733-6600. Two performances each night, 7 and 8:30 pm. Oct. 5: Free admission—as part of Pittsburgh's RADical Days (RAD as in Regional Asset District) admission is free today only (during regular hours). Oct. 25: Haunted Moonlight Tours—see the Keith House by night at this popular annual program. Admission: $15 per person. Tours approx. every half hour between 7 and 9:30 pm. Oct. 3 and 24: Hands-on History Days—children of all ages get to experience seasonal chores, hands-on crafts, wagon rides, and more. Admission: $10 per person (children 5 and younger get in free). Contact Sheri Brown for details: c-sbrown@pa.gov or 717/569-0401 x 228. 10 am-3 pm. Oct. 12-13: Harvest Days—a classic special event and a great way to celebrate the coming of fall. 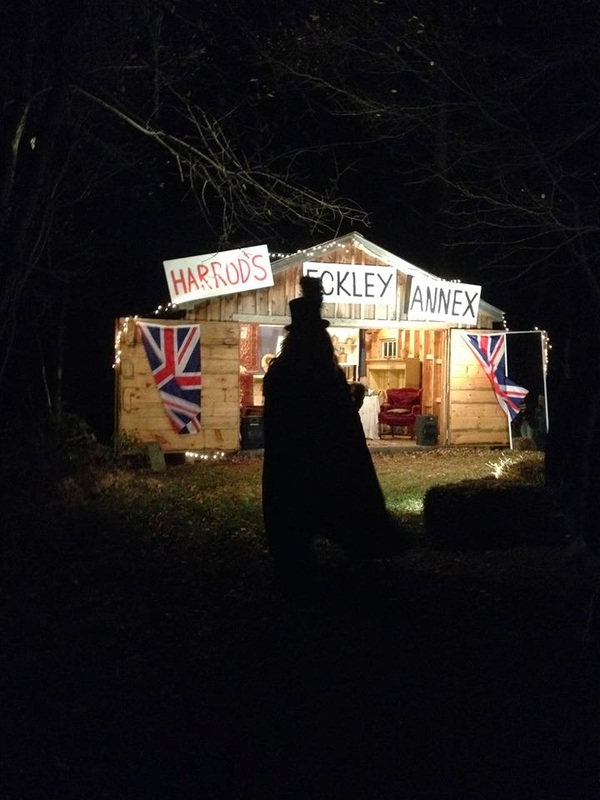 Loads of demonstrations and activities for the whole family in a beautiful setting. Admission: age 12+, $12; age 65+, $10; age 6-11, $8; free parking. 11 am-5 pm. Oct. 12: Oktoberfest—this fundraising event features German beer and traditional foods with entertainment by Burke’s Bavarian Band. $40 ($32 for Friends of OEV); deadline to purchase tickets is Oct. 7 (call 724/266-4500 x 102 or 113). 6 pm. Oct. 19: Trades Workshop – Basket Weaving—learn to make baskets in 19th-century style at this all-day workshop led by Harley Allen. The workshop registration form has the details. Deadline for registrations is October 16. Fee is $50 ($40 for Friends of OEV) and includes lunch and materials. Oct. 26: Making Wool Flowers—turn scraps of wool into decorative flowers for hats, coats, or hooked rugs (or whatever else you want to adorn). Class will be taught by Nan Loncharich, whose work can be found in OEV’s museum store (she’ll be signing her book on the 26th, too). $30 per person includes materials. Registration deadline is Oct. 21. Oct. 6: Historic Trades—your last chance for this season to visit the blacksmith and joyner as they demonstrate their skills with metal- and woodworking. Included in regular admission. 1-4 pm. Oct. 13: Living History Theater—you are invited to join Penn’s steward and housekeeper, John Sotcher and Mary Lofty, as they are united in marriage according to 17th-century Quaker wedding customs. Sign the wedding certificate and chat with William Penn and other guests. Included in regular admission. 1-4 pm. Oct. 20: Open Hearth Cooking—the cooks will have the oven fired up and the aroma of freshly baked bread will be everywhere. Included in regular admission. 1-4 pm. Oct. 27: Family Halloween and Living History Theater—enjoy trick-or-treating, traditional fall activities, and games. There will also be a living history theater presentation of the 1684 trial of Margaret Mattson, accused of witchcraft by some of her neighbors. Included in regular admission. 1-4 pm. Oct. 5: Sawmill and Birch Still operating—a rare opportunity to see a c. 1900 steam-powered sawmill in action, as well as a still used to extract birch oil (used as flavoring and medicine). Included in regular admission. 10 am-5 pm. Oct 12-13: 32nd Annual Fall Antique and Collectible Show—this semi-annual event supports the programs of the Lumber Museum. Please note that the event takes place at the Pine Creek Inn, 1637 US Rt 6, Galeton. Consignments are accepted; contact Pete Folk, 814/435-8216. 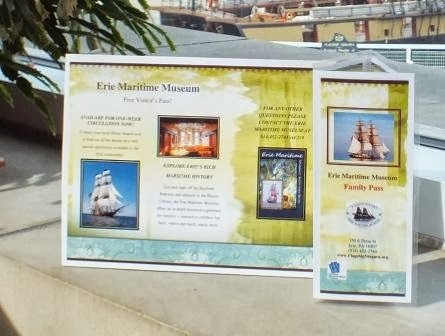 Admission: age 12+, $4.50; age 3-11, $3 (look for discount coupons in the local paper). 10 am-4:30 pm. Oct. 5-6: Then & Now Living History Encampment/Bivouac—this program offers a living timeline of military uniforms and equipment from colonial times to the present. Admission is free. 10 am-4 pm. October and November: Outreach Program—museum educators will be visiting branch libraries throughout the Library System of Lancaster County to present hands-on programs for young readers and their families. Oct. 6: Garden Railways Tour—this year’s event features 12 outdoor model train layouts at private residences or retirement communities in Lancaster County. This close to the event, tickets ($10 per person for ages 6 and up) may be purchased at the museum or at any Stauffer’s of Kissel Hill store in central Pennsylvania. The Garden Railways Tour flyer has more info; a map of participating locations will be provided with your ticket. 1-5 pm. 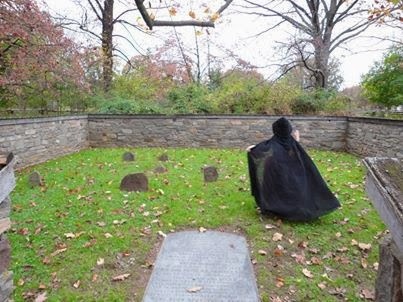 Oct. 17: “Gone but Not Forgotten”—staff and volunteers will present a program on tombstones, focusing on local cemeteries, unique stones, epitaphs, and symbols. Regular admission charged (free for members). 6:30 pm. Oct. 26: Historical Halloween—Trick-or-treating with a historical theme, following the site’s pathways by lantern light. Admission: $5 per car. Please bring canned goods for the local food pantry. 5-8 pm. Through Oct. 20: Latino-Hispanic Art Display—this exhibit features the work of Henry Bermudez, Susana Amundarain, and Michelle Angela. Included in museum admission. Oct. 16: National Fossil Day™—visit the Dino Lab during a special Learn at Lunchtime program to see the bones of a mammoth discovered at the bottom of Erie County’s Lake Pleasant in 1991 and recently acquired by the museum. 11 am-1:30 pm (museum admission will be free during this time slot). Oct. 18: Night of the Great Pumpkin & 3rd in the Burg—enjoy planetarium shows, creative pumpkin carving, storytime, live animals, crafts and snacks during this family-friendly event. Admission is free. 5:30-8 pm. Oct. 13: Historic Foodways—check the website for more info closer to the date. 11 am-3:30 pm.